Sprouts are one of the most complete and nutritional of all foods tested. Sprouts are real 'Life Vitamins, Minerals, Proteins, and Enzymes. Their nutritional value was discovered by the Chinese thousands of years ago. Recently, in the USA, numerous scientific studies suggest the importance of sprouts in a healthy diet. Have you ever heard of a vegetable that continues to gain vitamins after you harvest it? Sprouts do! Sprouts are living foods. Even after you harvest your sprouts and refrigerate them, they will continue to grow slowly, and their vitamin content will actually increase. Contrast that with store-bought fruits and vegetables, which start losing their vitamins as soon as theyre picked and often have to be shipped a thousand miles or more in the winter. 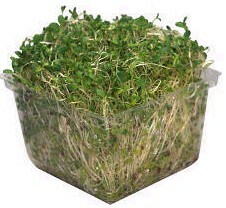 While we generally recommend the sproutamo easy sprouter, glass jar, or sprout bag method of sprouting, we offer some appliances which may make sprouting easier. We personally feel they are quite overpriced for what they are, and encourage you to learn how to sprout WITHOUT any appliances, but offer them for people that desire convience. Click here to see our Sprouter Comparison Chart that compares the automatic sprouters we offer.